Got 20 minutes? Then you’ve got dinner! 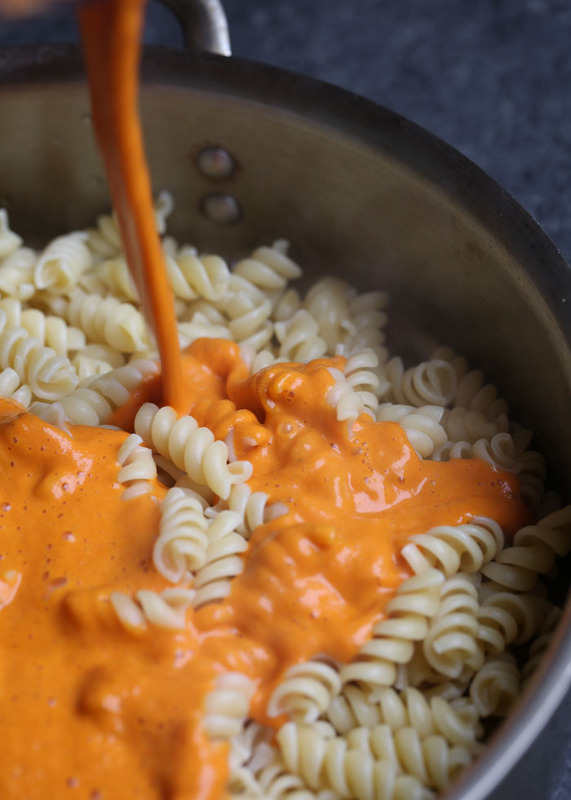 An impossibly creamy, full-of-flavor sauce coats curly pasta for this awesomely easy pasta dish that’ll please vegans and carnivores alike. If you follow anyone from Seattle on social media, I’m sure you’ve heard all about the crazy amount of snow we’ve been getting. At our house, we’ve been snowed in for the majority of the past eleven days, and over the last day and a half it dumped probably another foot (!!!) of snow. This amount of snow is almost unheard of around here, and I’d go so far as to say that most of us are wildly unprepared for it. We’ve been using garden shovels to scoop snow (why have a snow shovel when we only need it once every 10 years?! Oh right, because it would have been really nice to have one for #snowmageddon!) And only yesterday did it occur to us that we should knock snow off of flat roofs and other surfaces, drooping tree branches, and our (previously thriving) garden vines. Meanwhile, our grocery stash is growing a bit slim. I really wanted to come up with a marvelous Valentine’s Day recipe for y’all, and I’ve been working on an amazing, almost-there raspberry sweet roll recipe. But I don’t have it quite right yet and I ran out of the ingredients to continue testing it. 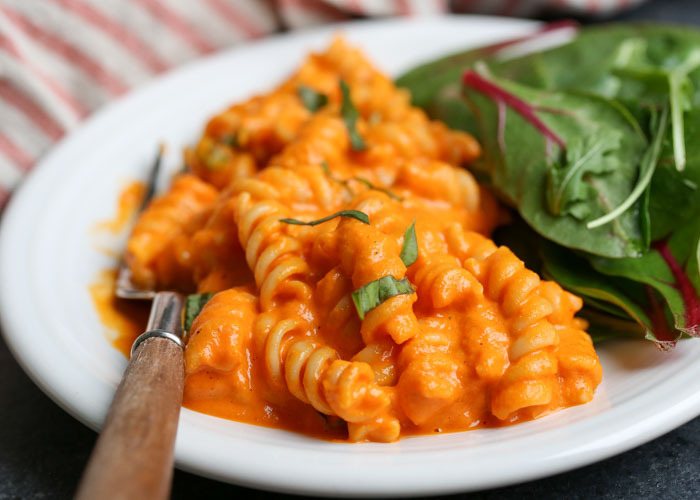 Luckily, I had just enough groceries in the pantry to make and photograph this Creamy Vegan Roasted Red Pepper Pasta, a favorite dinner of late. It used up my last 1/2 of an onion and the basil in the fridge was definitely a little peaked, but I think I pulled it off. I really didn’t consider this one a Valentine’s Day recipe because instead of being red or pink it’s kind of more of an orange. But if you eat by candlelight and serve it up with some heart-shaped bread or something (is there such a thing? There should be), I think it’ll pass. So what do we have here? Pasta of course. I like rotini for this one. One with some nooks and crannies is desirable here because it’ll grab and cradle all of that delicious sauce. And that sauce, my friends. It’s so deceptively simple. Sauteed onion, oregano, and garlic. A bit of tomato paste. A jar of roasted red peppers. Some cashews for their signature glorious creaminess. Puree until smooth and luscious, aaaand done. This recipe comes together in about 20 minutes, which in my book makes it a contender for many a future weeknight dinner – not just V-Day. 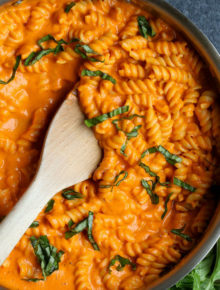 Even if it’s more orange than red or pink, I love this recipe. And Valentine’s Day is all about love, right? I know, I know … it’s a stretch. Either way, Happy Valentine’s Day, and stay warm out there! Cook the pasta. Place a large pot of water on the stove to boil. Once boiling, add the pasta. Cook according to package instructions (usually about 8-10 minutes). Drain and set aside. Saute the onion, oregano, and garlic. While the pasta boils, set a medium saucepan over low heat. When hot, add the olive oil. Add the onion and oregano. Cook, stirring occasionally, until softened and beginning to get translucent, about 8 minutes. Add the garlic and cook, stirring frequently, for one more minute. Add the tomato paste and cook until warmed through. Pour in 1/2 cup water and stir to bring up all of the bits of everything. Make the sauce. Pour the sautéed onion mixture into the blender. Add drained roasted red peppers, cashews, 1/2 teaspoon salt, and 1/4 teaspoon pepper. Puree until silky smooth, 2-3 minutes. 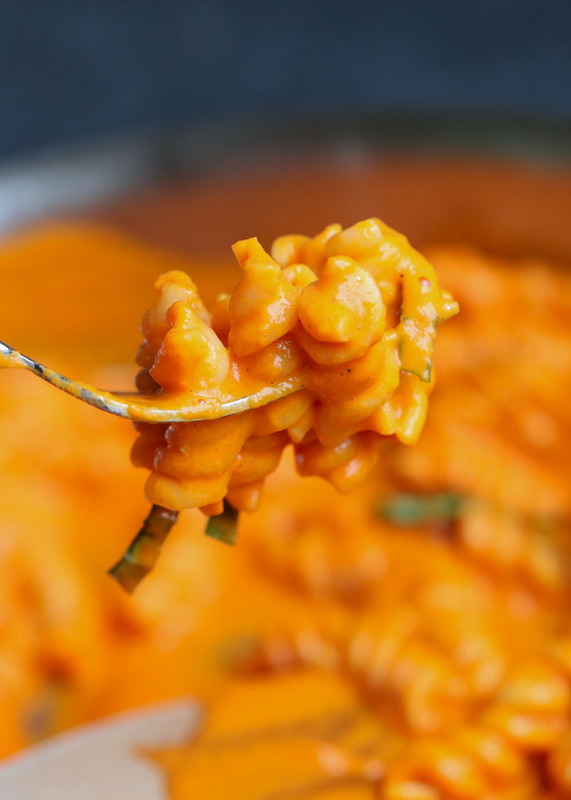 If the sauce is too thick to puree, add a bit more water, a tablespoon at a time. Mix the pasta and sauce. 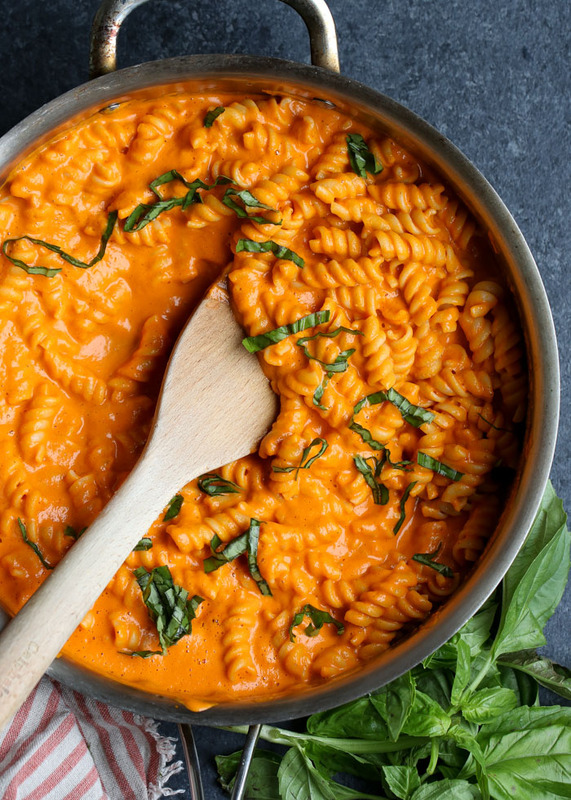 Return the pasta to the pot you cooked it in or to the saute pan – whichever is biggest! Place over low heat. Add sauce. Stir gently and cook just until warmed through, 1-2 minutes. Adjust seasonings. Taste and add more salt and pepper if desired. Garnish and serve. Sprinkle basil over the top and serve! * I find that with my Vitamix, I don’t need to soak my cashews first – they puree completely! If you don’t have a high-speed blender, you may want to soak your cashews in very hot water for 20 minutes before pureeing. 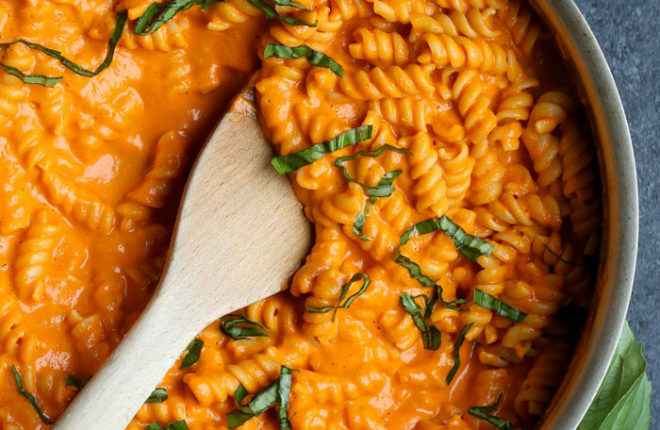 Use gluten-free pasta. My favorite is brown rice pasta. Hello, Kare, I tried this tonight and it was delicious! I love that it’s relatively low-calorie, and it was so creamy! Thanks for the great recipe!